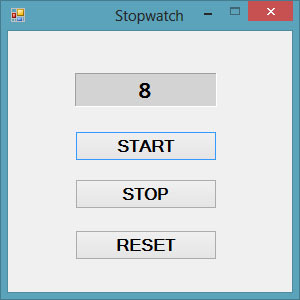 Timer is a control in Visual Basic 2019 that that can be used to create applications that are time-related. For example, you can use the timer to create a clock, a stopwatch, a dice, animation and more. The timer is a hidden control at runtime, just like the engine of a car. We shall illustrate the usage of timer using a few examples. 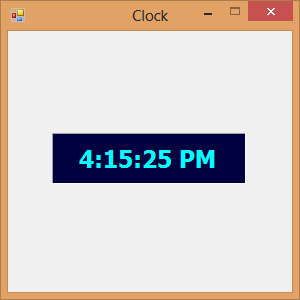 To create the clock, first of all, start a new project in Visual Basic 2019 and name it MyClock. Change the text of the Form1 to MyClock in the properties window. Add the Timer control to the form. Next, insert a label control into the form and change its font size to any size you wish, and set the text alignment to be the center. Next, set the Interval property of the Timer control to 1000, which reflects a one-second interval(1 unit is 1 millisecond). Set the MaximizeBox property of Form1 to false so that the user cannot enlarge the clock. Lastly, set the Enabled property of the Timer control to True so that the clock starts running as soon as it is loaded. *TimeOfDay() is a Visual Basic 2019 built-in function that returns the current time today based on your computer system time. 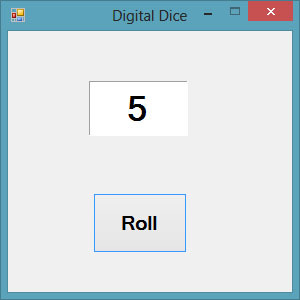 We can create a digital dice easily using the Timer Control. To create a dice, you need to generate random numbers using the Rnd function. Rnd generates numbers between 0 and 1. The following statement generates random integers from 1 to 6. In the code, we introduce the variable m to control the length of time of the rolling process. If m is more than 1000, then the rolling process will stop by setting the timer enabled property to False. Set the timer interval to 10 so that the number changes every 0.01 second.